When we first saw the AutoWrench, we thought, “Pretty cool. Looks a little flimsy.” It’s packaging promised it’d stand up to a pretty beefy 225 ft-lbs of torque, so we had to find out for ourselves. We constructed a simple test rig and pushed it all the way to failure. Read on for our results complete with lots of photos and even a video — a Toolmonger first — of the first test to failure. 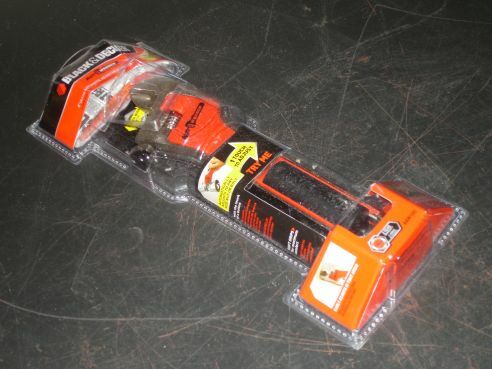 The AutoWrench hangs from the store shelf in the now ubiquitous form-fitted clamshell packaging with a very inviting “try me” label affixed. The packaging leaves the wrench’s two-way acutator switch open so you (and everyone else) can play with it before buying. The good news: It’s fun to play with, and will probably increase sales. The bad news: Everyone else’ll play with it, too. 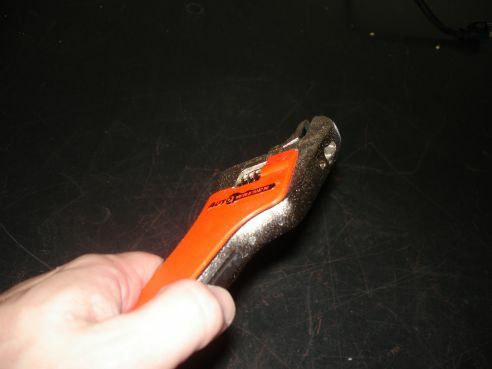 You’re likely to receive a tool with at least partially-drained batteries. Holding the AutoWrench, we were surprised by its heft. Even though a good bit of its middle is made of plastic, the batteries more than make up the difference. The battery box is quite large as well, but is surprisingly unobtrusive. It helps that Black & Decker made the battery box rounded so that it actually fits well into your hand. The AutoWrench’s magic starts with you push the two-way rocker switch on its side just below its jaws; This switch actuates a small motor to automatically move the jaws open and closed. We used the AutoWrench around the shop for a few days, and enjoyed the convenience it offers. But we couldn’t get that nagging feeling out of our mind that it was more flimsy than it felt. It is largely plastic after all. We had to find out in real terms how much torque it could handle, so we set out to assemble a rig to test it. Next: On page 2 we build the test rig. I bought this a couple of months ago on it’s “coolness” factor after playing with it on the endcap display. Have yet to get any regular use out of it, but it’s good to know the quality is there and that it’s not junk. Thanks, Toolmonger! I really don’t understand the need for this tool other than to sell more batteries. Is it really that hard for people to operate an adjustable wrench with one hand? I really don’t understand why this post is longer than 5 paragraphs. Did it work? That’s all I want to know. I don’t care what color shirt you wore that day. Eh, I don’t know. I assume you’re referring to the extended coverage of the torque test. Well, the tool claimed a specific torque specification and the review put that claim to the test. I, for one, appreciate that they explained their testing methodology. Very nice review. I loved the depth of detail that you went into on how you did your torque tests. Thanks for adding the baseline info. So the motor is like the kind you would find in a toy car, or is there some sort of gear head on it. Reviews need to be indepth (good write up BTW). It’s exactly the kind you’d find in a toy car. There’s a small plastic pully on the end that drives the screw via a belt. The rocker switch is also mounted on a small (just barely bigger than the switch) board that’s easily removable. In fact, you can pull the whole mess out without cutting the wires. I never knew this product existed, but after reading this I might have to go out and buy one. This would be an invaluable tool for someone working with very tight clearences, such as under a car. You have no idea how handy this would have been on the last couple projects I did; removing driveshaft bolts without dropping the exhaust of a rear-wheel drive car for instance. It’s a handy little gadget that just might wind up in my toolbox! But really, shouldn’t you have the correct size combination wrench for that? I use an adjustable when I’m in a rush but I’d rather not risk rounding a nut on my car. I think this thing would be good for one of those road side assitant kits that you put together and leave in the back of you car. Or for leaving in the stuff drawer in the kitchen. Because as we all know. Use the right tool for the right job. An ajustable wrench isn’t the right too for anything. This looks like the type of tool that would be pretty handy to have in the kitchen drawer. Under a car doesn’t sound like a good place for this wrench unless the inner workings are very well sealed. Based on the description of the motorized adjusting system, I suspect that a slug of just about any fluid that would come out of a car could render the tool non-functional. Likewise bits of rust and gunk that tend to break loose from a nut or bolt being tightened or loosened could jam things up. The tool certainly seems to have lived up to it’s claims and expected functionality, but I can’t imagine me buying one. Cool write up — looks like you had fun testing it. I don’t use adjustable wrenches much, so I can’t see spending $30 on a novelty tool. It seems like a product in search of a market. Found you via MAKE Blog. Great write up! I got a question for you. 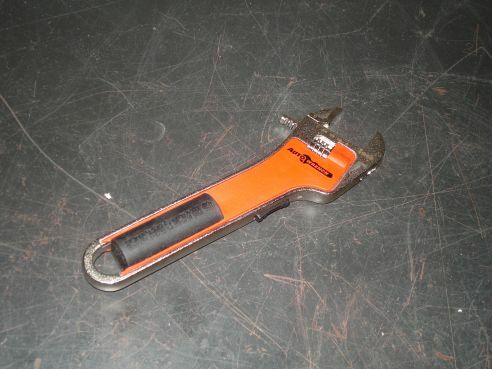 The picture that shows the wrench that you compared the Autowrench to looks like you used a 10″ adjustable. If this is correct than a 10″ adjustable is normally rated at higher foot-lbs. torque and of course would out-beat an 8″ adjustable like the Autowrench. 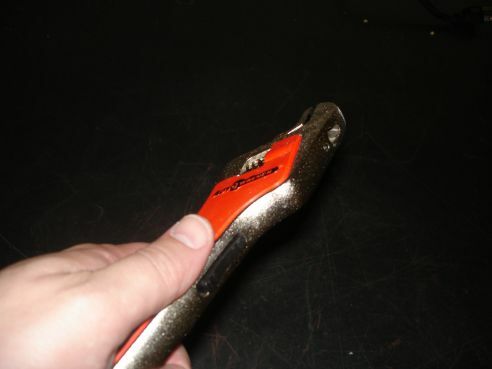 However, it sounds like your test confirmed that the Autowrench is a quality tool and is a new twist for an old tool! Thanks again for an indepth report. Did you actually know the reason for the length of the spanners. Ever seen a 10mm spanner with a really long handle. From what i heard is that the length is based on the torque that should be placed on to a bolt. A longer handle will place too much torque on the bolts. 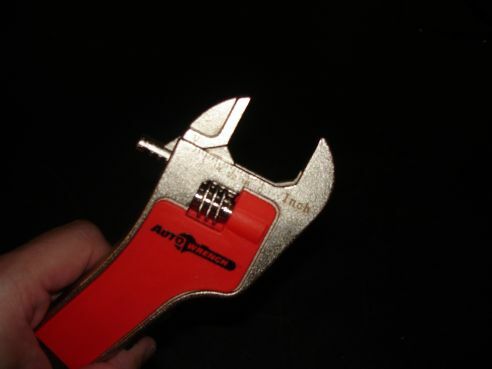 Try always to use the correct spanner for the job so you will not destroy the bolts. If you need specific torque for a bolt there are some good small, medium and large Torque spanners or attachments for your tolls available. For safety never add an extender to a spanner unless it is designed as such. Good test, I guess. It worked well around the shop, but let’s see if we can break it. Okay. 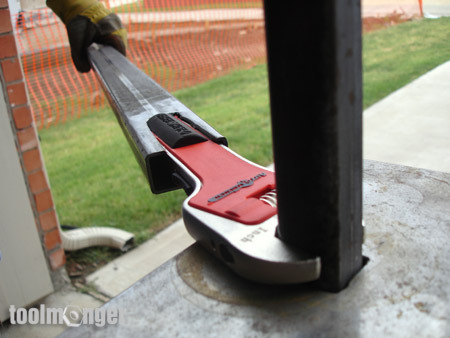 Wouldn’t a more fair comparison, though, have been to have tried the same leverage on Cooper Tools, Crescent Wrench that has a manual slide to adust the wrench, instead of a standard adjustable wrench? Awesome review! Very informative! It sounds like the perfect gift for the man who already has everything…my dad. Thank you! This is the most in-depth tool testing I’ve seen published on the internet. Neat examples using sound principles by folks that obviously know their stuff (plus who doesn’t love using a plasma cutter). Keep up the nice work, people!! More and more tool shoppers will visit your site with a little “word of mouth” advertising, and I plan to begin just that. Did the inventor sell this to Black and Decker, or did they steal his idea? Anyone who knows can email me at Dpehta@aol.com. thanks! Don, I am happy to say that Black & Decker is an honorable company and they did not steal my idea. We signed last year and we worked together to bring the latest and greatest to the people. Black & Decker has done an outstanding job on the “Auto Wrench” and I am very happy to be with them. Merry Christmas and Happy New year to all. (P.S.) Now if we can only get Modern Marvels to do a sequel we could share the rest of the story and good will to all! BTW- These guys here at Toolmonger did a good job, too. Good review and I enjoyed reading the testing process. And this has been a great tool to get as a “what in the WORLD do I get him/her” gift for anyone at all into gadgets. I can’t at all say if they used it (especially, as others have mentioned, how often do we really need an adjustable wrench??) or how well it worked, but the smiles over it’s “coolness” factor were worth the cost. And definitely get one from the BACK of the rack, if you want the batteries to have any life to them. I have had this wrench for a while. I used it once or twice, but most recently it failed due to the belt breaking. It would be easy to replace, but I can’t find it anywhere. Anybody got any ideas? I got this a couple of years ago as a present. I just took it out of the package and found it would not work. After replacing the batteries, I discovered that the cheap plastic drive belt was broken and no replacement parts are available. What a piece of junk! A sizable investment worthless for a 2 cent part. The rubber belt brakes and can’t get a replacement belt. I don’t recommend this product.